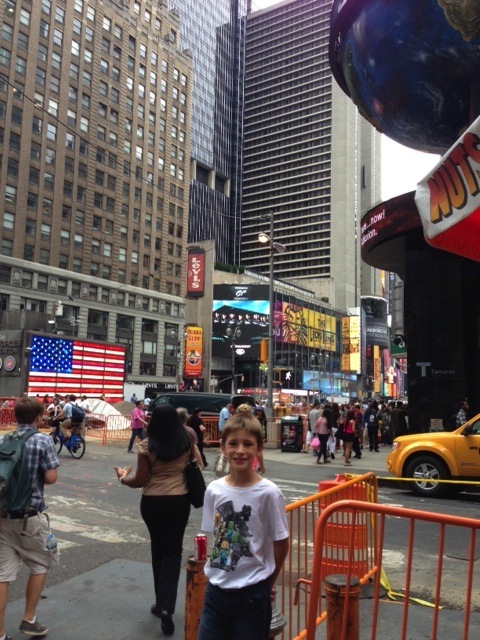 Hello World, I’m In The Big Apple! Our flight up to New York was great. My Dad let me sit next to a window on the right side so I could see Long Island (where I was born) as we came into the JFK airport. We had a car waiting for us who drove through Queens and then through the Queen’s Midtown Tunnel into Manhattan. We went under the East River. I have now been under the Hudson River and the East River. We are staying at the Waldorf-Astoria where we have stayed before. It is very old and full of polished wood and brass but also very nice. My dad had to go to the Apple Store at Grand Central Station while my Mom and I went downtown to B&H Photo but they were closed early on Friday because they are a Hasidic Jews and the store is not open on Saturday either. Then my Mom and I decided to walk back instead of taking a taxi. Walking back we went through Times Square and everything was crowded and fun like. People were taking pictures and you could hear all kinds of languages. I love the Big Apple. We were going to meet my Dad at the Apple store but we had already gone too far up Madison Avenue so we came back to the hotel. Tonight we are having dinner at the New York Athletic Club with our friend Arthur and his friend Mei Ling. She is an ophthalmologist and eye surgeon. Arthur runs the NY Waterway ferries and is nice funny man. Tomorrow its breakfast in the hotel and then our wedding in St. Patrick’s Cathedral and the reception afterward. I love reading these things Frederick, (especially your South American Darwin adventure.) Please keep them coming. Thanks. Wow! I wish I was there!